From the 1750s, the seeds of dissent were sown. The growing kingdom of Great Britain was becoming deaf to its colonies in the Americas. The royal and noble houses had become disinterested parasites pressing for additional taxes and goods to continue its conflicts with the kingdoms of France, Spain, and the Dutch. Parliament had become mostly interested in what was good for England and their estates than what was good for greater Britannia. A caste system of sorts arose. Those born to the landed gentry in England proper were ‘citizens’ and subjects to the Crown of the first order. Those who were not born in England or not landed gentry were not. Not being truly English then, they were subject to the needs of the home country and Crown. To be fair, there were some in Parliament who argued differently, but not enough of them. The results of a deafened Parliament and an uncaring monarch led to greater and greater stricture on goods and services outside of England. Parliament enactments to generate additional revenues for the Parliament and the Crown did not consider the impact to the lives of the individuals required to pay these additional burdens. In England at the time, the subjugation of others as liege lord to fief, vassal, peasant, slave was still the norm. It was acceptable thought to those who owned land, resource, and cannonade. Mr. Wilberforce’s time had not yet come. But those adventurous souls who left Europe behind and crossed the Atlantic did not feel that hard won industry in the Americas made them less equal as humans than those still in Europe; specifically England. The result of additional enactments by Parliament, with the approval of the Crown, was more dissention in the American colonies. With the enactment of the Townshend Acts in 1767, the Parliament in England established it had the power and authority to tax and levy the American colonies. The result was demonstrations and unrest requiring additional military force to control the main location of dissent, Boston. In 1770, five civilians would pay with their lives in a Boston square. The East India Trading Company enjoyed a monopoly in tea trade to England, yet was a failing company due to over taxation and duties required by Parliament to be paid. Rather than looking for ways to bolster the efficiency and profitability of the company, Parliament enacted additional taxation and monopoly of tea to its American colonies. Rather than pay this additional tax, a group of American colonials pretended to be ‘indian raiders’ and dumped the boycotted tea into Boston harbor in 1773. Parliament responded by closing the Boston port until the East India Trading Company was refunded the value of the tea. Letters began to circulate among the American colonies. Dissent became planned and armed insurrection. If the quartered British military was afforded a free hand to quell colonial unrest by force of arms, there would be those who would be willing to defend themselves from this harsh treatment. Colonial militia began to form, not in support of England and Frontier, but in opposition to Parliament and Crown. The price of insurrection was trial and slavery at best; perhaps a firing squad; at worst, hanging in the public square. Life and fortune was in the balance for taking up arms against an unhearing Parliament and Crown deaf to the plight of its subjects. In 1775, the Crown authorized British forces in the American colonies to seek out and confiscate any munitions held in reserve for American militiamen. In April 1775, a contingent of 700 British regulars marched from Boston to search out and destroy military supplies thought to be held in Concord. 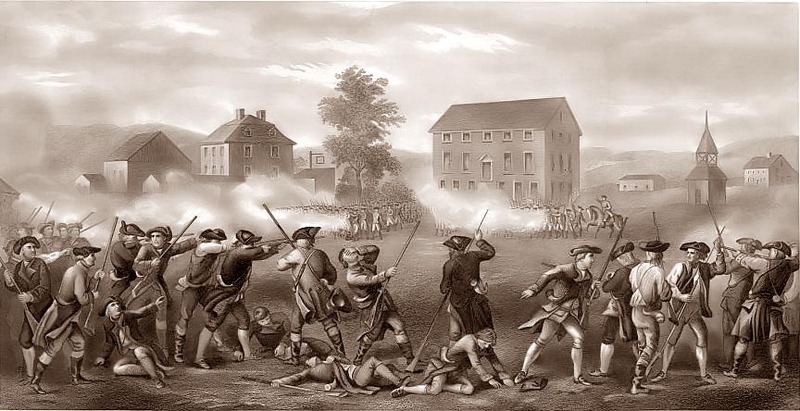 Between Concord and Boston was Lexington and Captain Parker’s troop of colonial militiamen. On the Lexington Commons, Captain Parker’s band arranged themselves against a force superior in numbers, training, experience, and equipment. Historians are not certain of events that occurred but a shot was fired. The result was eight colonial militiamen were killed and an American colonial force exchanged fire with a British Regular force. These first shots became a rallying point for thirteen British colonies in America. How deaf does a government have to become, how blind to the plight of its people must it be, that it no longer concerns itself with the people for whom it represents but instead feeds its own needs and wants for the game of empire? On this Patriots Day, April 19th, 2010, let us reflect on our place in history. Let us honor the memory of the men and women, slave and free, who laid down their lives, their futures, their fortunes for the cause of freedom. Freedom is not free. It comes at a great price. Let us remember those men and women who paid that price with their lives in combat and with their lives in service to their country. There have been other times in our history, other than the late 1770s, that have required a response to those who would remove the freedoms of this union. And good men and women stood up as patriots then to do what was needful and required to ensure the blessings of liberty remained so in the United States of America; not just for themselves alone but to their posterity, their grandchildren and their grandchildren. It may seem alarmist to say today we are facing similar threats to our people. I am sure in 1776 there were arguments that a declaration of grievances was too harsh or alarmist, but after 25 years of worsening relationships with a government that no longer represented the people of the British colonies in America a change in government was required. Under the Constitution of the United States of America, we possess a tool for change in government: the individual vote. Unlike other governments in the world, when a body of representatives move from representation to plutarchy, oligarchy, and autarchy it is time for their removal from office in governing the United States of America. In times past, men and women have taken up arms in opposition to unjust government. In times current, men and women can take up their vote as their voice and replace a government that does not hear with one that will remember their role. Let President Lincoln remind us as he stated in his address to Gettysburg. Let us resolve to remember at what price Liberty was purchased for this generation. Let us resolve to serve Liberty in this current hour that we might purchase again Liberty with our voice and vote for succeeding generations. Let us resolve to hold to those ideals that led to risk of life and fortune for the cause of being able to live free. Whether this is your first generation in Liberty or your 5th, let us hold dearest this Constitution of ours and to the surety of the intent of its authors. Let us resolve this day to be in remembrance of the price of being a Patriot and at what price Liberty must be purchased continually.